Many people desire a fresh and light look when renovating or refurbishing their kitchen, but it’s often difficult to decide exactly how to achieve this. One very simple way to give your space a lovely touch of vibrancy and a splash of airy colour is to opt for a shade of duck egg blue as part of your overall chosen palette. Not dissimilar to sky blue, this hue is soft and not too cold, and is particularly popular in typical French and Swedish interior décor – so its popularity is only growing as these particular schools of design are becoming increasingly in vogue. The colour pigment for this particular shade was discovered towards the latter end of the 19th Century and is regularly mixed with white or grey to adjust the tone to be softer, darker or paler. The colour is also known as robin egg blue, and a brighter, more vibrant shade is utilised as Tiffany Blue – the super stylish signature colour of accessories and shopping bags created by famed jewellers Tiffany & Co. So how can you add duck egg blue into your kitchen design? The specialists at The Kitchen Warehouse have a few tips. 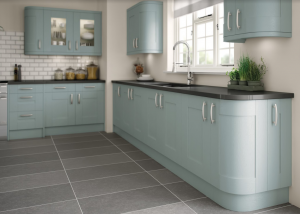 If your plan is to brighten your whole kitchen with this attractive shade, why not select Duck Egg Blue Kitchen Units throughout? The more light colours you use throughout your space, the brighter and more spacious it will look. You could choose duck egg blue for all of your units, or contrast it with white, dove grey or natural wood (preferably with a greyish tint) for either your overhead cabinets or floor level cupboards. White, grey or natural wood kitchen units with duck egg blue surfaces is a unique and eye-catching option. Again, it will create the sense of greater space and instantly brighten the room. One of the great things about the shade is that because it’s pale, you’ll be able to see dirt more easily and wipe it away quickly, preventing the spread of bacteria. It is also possible to choose replacement kitchen doors that contrast with existing units, which will help you to save money if the main bodies of your cupboards and cabinets are still in good nick. If you reckon the colour you already have will go well with new duck egg kitchen doors, all you need to invest in are the doors themselves. Otherwise, you may want to treat, paint or finish your units in a way that works more successfully with the shade. A subtle and attractive way to bring your kitchen to life with a splash of bright, light blue is by applying tiles in that colour while furnishing the other elements of the room in a more subtle hue. The wall around the oven and the hob splashback is often a popular spot for tiles, or you can apply them to other areas to which you wish to draw visitors’ attention. You don’t even have to create a solid block of coloured tiles – carefully interspersing them throughout larger sections of white or another colour will offer occasional splashes of colour that creates ongoing interest throughout the space. It is always fun to make a feature of the more functional items in your kitchen, and an elegant duck egg blue fridge, oven or stove will bring a sense of style to elements that could otherwise look mundane or unattractive. Match all of your appliances in the same hue for occasional bursts of colour throughout the space. An even subtler option is to furnish with items, artworks and kitchen accessories in duck egg blue, making them into focal points and utilising your units and surfaces as a soft, unintrusive backdrop for them. Kettles, tea sets, pan sets, plant pots, utensils, aprons, oven gloves, tea towels, rugs and plenty more are available in this tone. It’s currently bang on trend, so you won’t have to look far for the finishing touches you need. You can get a duck egg blue kitchen comes in a myriad of different shades, so it’s best to first track down the ones you’re most interest in and try them out. The majority of hardware shops will provide you with paint or tile samples or colour swatches, which is a great way to find out what a colour looks like in “real life”, as it’s often difficult to judge from a picture. Once you’ve decided how you wish to incorporate duck egg blue into your design, the next step is to start hunting down your chosen products, swatches and samples in hand. If you’re interested in colourful units or doors, it’s definitely best to take a look around showrooms to see those items “in the flesh” and compare them with your chosen shade. You can always ask a sales assistant there for ideas, inspiration and advice. At any reputable company will employ individuals who are helpful, knowledgeable, happy to offer their honest opinion and answer in full any questions or queries you might bring to them. That’s certainly the case at The Kitchen Warehouse. You can find our showroom at Hutton Moor Farm, Hutton Conyers, Ripon, North Yorkshire, HG4 5LZ. It’s open between 9am and 6pm from Monday to Friday, and from 10am to 3.30pm on Saturdays. There, you’ll find whole units, individual doors and specially selected accessories in duck egg blue – perfect for the look you’re planning. You’ll also always find a helpful team member nearby to assist you, so your experience with us will always be straightforward and stress-free.